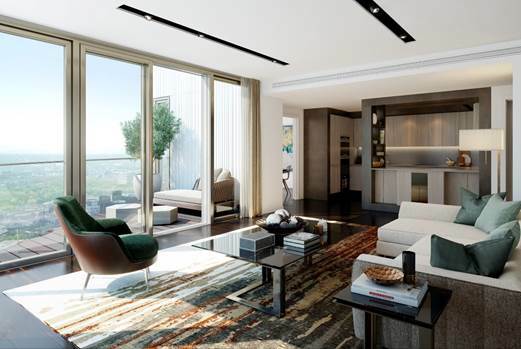 Standing at 58 storeys and designed by Herzog & de Meuron, the Swiss practice behind the Tate Modern and the Bird’s Nest in Beijing, One Park Drive is London’s latest gem. 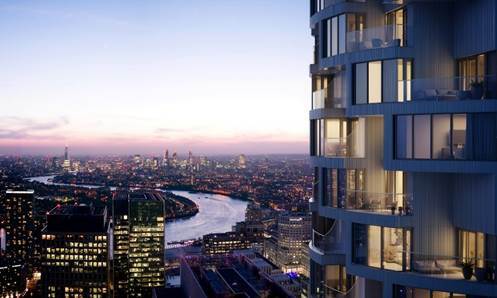 It will house 483 elegantly designed apartments under the Canary Wharf Group. Featuring beautifully crafted interiors, an exclusive residents’ health club and private balconies providing stunning views of the surrounding docklands and wider London, the private 128-acre Estate is one of the world’s great city spaces. It is internationally renowned as one of London’s most vibrant districts with a unique waterside location. 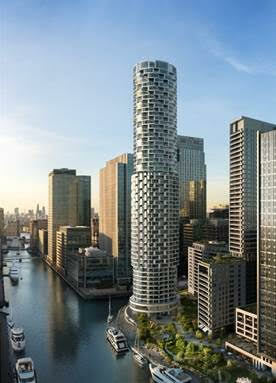 One Park Drive will form the centrepiece of Canary Wharf’s new district, Wood Wharf. The neighbourhood will welcome a new community with the buzz of city life, filled with up to 3,600 new homes, 380,000 sq.ft. 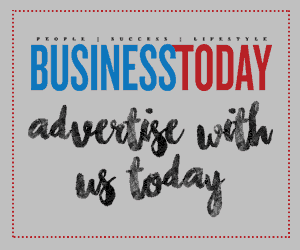 of retail space, eight acres of public spaces, plazas and parks. Amongst this will sit lively high streets, boutique shopping arcades, a vast collection of public art, doctor’s surgery and a brand new two-form primary school. One Park Drive itself is divided into three distinct typologies which are Loft, Cluster and Bay. The Loft apartments, which feature interiors by Bowler James Brindley, are some of the largest properties available. Situated on floors two to nine, Lofts are designed to make the most of the connection to the surrounding green spaces and waterfront, with generous wraparound terraces and free flowing spaces complete with sliding walls, resin floors and mother of pearl clad bathrooms. The Cluster apartments, with their interlocking geometric façades, form the heart of the building. 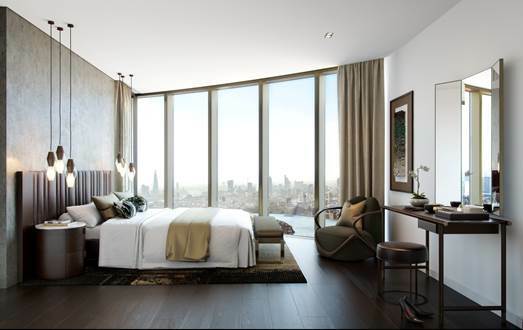 With contemporary interiors by Goddard Littlefair, the Cluster typology contains the greatest variety, with the lower levels connected to the parks and water; the higher floors with the sky. The top floors are home to the Bay apartments, which all boast double-height terraces set back into the building. These properties also feature interiors by Goddard Littlefair, with elegant palettes and cool textures, exposed concrete walls, timber panelling, pivot doors and natural stone which all aim to maximise light. One Park Drive will also offer state of the art amenities designed by GA Design, split over the ground and first floors. Residents will benefit from a sophisticated entrance lobby with 24-hour concierge services; library, cinema room and lounge on the ground floor, whilst the first floor houses an exclusive residents-only health club. 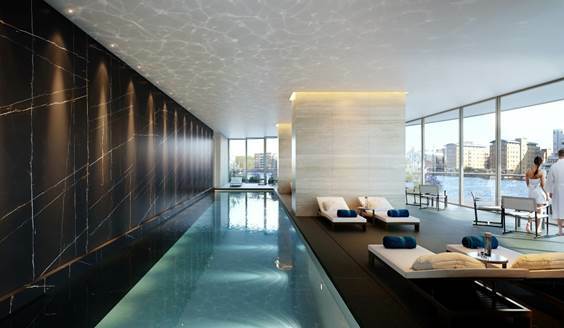 Framed by floor-to-ceiling glazing, this calming space, which includes a 20-metre pool, gym, studio space and spa, invites stunning views of the surrounding parks, gardens and water. The landmark development will be launching in Kuala Lumpur.